Many times, driving down the Malecón on my way to Old Havana, I have admired the caryatids of the beautiful building that is home to the Centro Hispanoamericano de Cultura–Spanish American Cultural Center. And many times I have promised myself to attend some of the many cultural events that take place there. So, it was a very pleasant surprise when Irene Rodriguez chose this venue for our interview. We met at the institution’s small yet well-equipped theater where she and her successful Spanish dance company were rehearsing. Even for anyone who hasn’t had the privilege of seeing Irene on stage, it would be quite easy to make her out among the four young women who were stamping their feet away. Very young and very self-assured, she conducted the rehearsal, oftentimes demonstrating herself how a step or movement should be made. She greeted us courteously but I sensed that she was somewhat upset because we had arrived 15 minutes late. Later on we learned that punctuality for Irene is a sacred word and a matter of principle–every minute counts–and that she demands of her dancers not only the best results but strict discipline and hard work. It is precisely discipline and perseverance the virtues that she values above everything else and she firmly believes that they can make a dancer (or any artist, for that matter) beyond any physical disposition or innate talent. And Irene Rodriguez indeed possessed all those virtues and more when at the “ripe old age” of 11, Eduardo Veitía, Director of the Spanish Ballet of Cuba, asked her to join his company to take lessons there. Five years later, she graduated as a ballerina and became part of the corps de ballet of the company. Little did her mother suspect when she enrolled her daughter in classical ballet at the Andalusian Cultural Center of Havana that little Irene would duck out of class and join the Spanish dance classes which she clearly found closer to her spitfire nature…and heart. Irene’s mother is very important in her life. She is not only her mom but also the company’s representative. The talented daughter speaks of her mother with respect and much appreciation, aware of the decisive role that her mother has played in her life and successful career. Although her mom’s dream was for Irene to become a ballerina, she supported her daughter’s wish of studying Spanish dance. After her five-year training under Veitía, she became a full member of the Ballet Español de Cuba where she rose to First Dancer and also became a teacher, choreographer and maître. She studied Acting at the University of the Arts (ISA) and received Gold Diploma upon graduation in 2007. She has played a few roles in the theater and she is convinced that this experience is an important factor in her choreographies. When she auditions dancers for her company, she looks for integral professionals who are knowledgeable and skilled in different genres of dancing, as well as theatrical talent. In her opinion, if you don’t have dramatic aptitudes, dancing becomes mere gymnastics. This is why it is not easy for her to find the right dancers, despite the many schools that now teach Spanish dance from very early ages. Little girls donning long black skirts with flounces, shawls and flowers in their hair on their way to dance classes after school has become of late a common sight in Havana. The girls and boys of the Irene Rodríguez Company do not hide their pride in being part of this very young dance troupe founded in January 2012. The long rehearsal hours, the endless repetitions the young director puts them through have produced rave reviews everywhere they have performed. 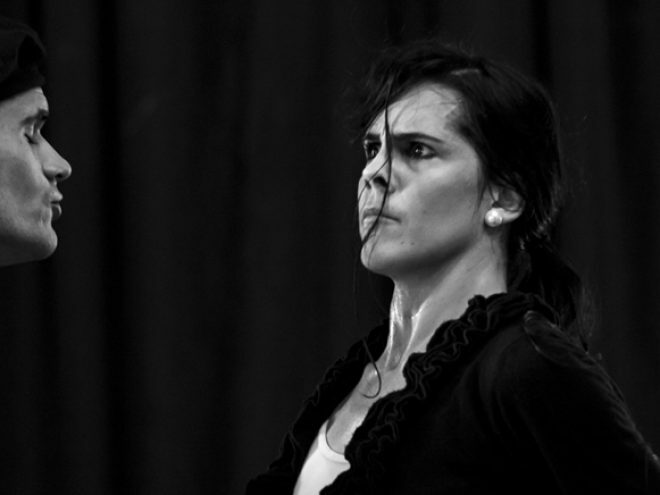 Apart from the work she carries out with her own company, she is the Spanish dance choreographic adviser and maître of the Cuban National Ballet, and at the request of Alicia Alonso, in 2012 she became the artistic director of the La Huella de España Festival–the Spanish Imprint Festival. Her many choreographies have been performed by the Spanish Ballet of Cuba, students from the Spanish Dance Faculty of the University of the Arts and outstanding students from the National Ballet and Opera School, besides her own company. Some of her most famous choreographies–acclaimed by both audiences and critics–are Suite del Sombrero de Tres Picos (a Spanish classic), Al-Ándalus (Flamenco), the work in two acts Emigrantes, which covers several dance styles, including Afro-Cuban, neoclassical and flamenco; and El crimen fue en Granada based on the poem of the same name by Spanish poet Antonio Machado and which garnered her the First Prize at the 7th Alicia Alonso Spanish-American Choreography Competition in 2012. This prize is only one in a long list of accolades and awards received by Irene as dancer, choreographer, promoter of Spanish culture in Cuba and collaborator with the Spanish Associations in the island. Because of this important work, the Federation of Spanish Associations in Cuba presented her with the Miguel de Cervantes y Saavedra Award for her extensive career as leading figure in Spanish dance and for her contribution to disseminating Spanish culture. Outside Cuba, she has taught summer courses in Mexico for the PROART Academy for several years. In front of the camera, you hardly notice Irene Rodríguez’s restless nature that prevents her from losing even a second in her life. Courteously but firmly, Irene lets us know that she needs to continue with rehearsals for an upcoming performance. Outside the building, I picture Irene in her endeavor to take her company on a long journey that inevitably, and fortunately, can only lead to excellence. March 2015 This article formed part of the March 2015 issue of What’s On Havana The definitive monthly travel & culture guide to Havana Download our current issue of What’s On Havana, your definitive travel, culture and entertainment guide for all things happening in Havana, Cuba’s bustling and enigmatic capital city. We include features from around Cuba written by the best international travel writers covering Cuba. Our monthly online digital magazine is also available in Spanish and French.